The Coast to Crest Trail is the only trail on the western seaboard connecting northern California’s beaches at Redwood State and National Park to Oregon’s Cascade Mountains at Crater Lake National Park, a distance of about 200 miles through an almost unbroken sequence of wilderness areas, National Parks, National Forests, and pristine forest landscapes. 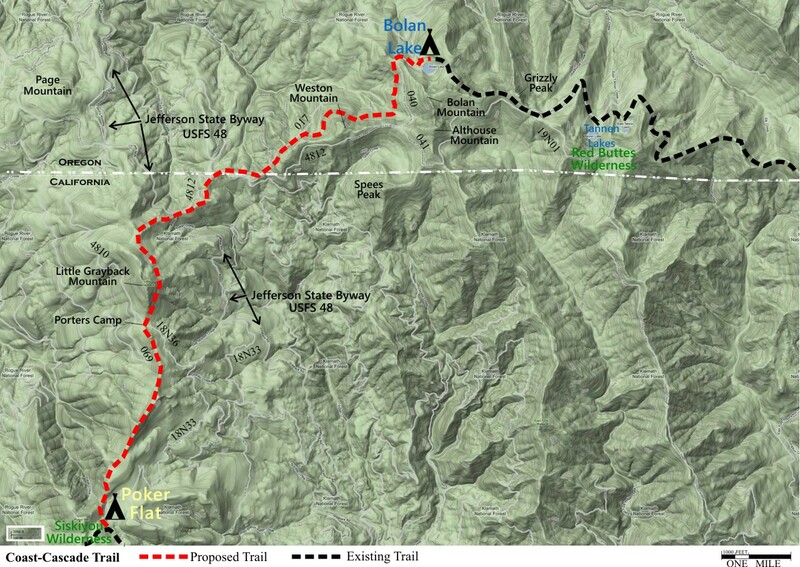 The Coast to Crest Trail is made up of existing trails except for an eight mile segment needed to connect trails in Siskiyou Wilderness with trails in Red Buttes Wilderness. 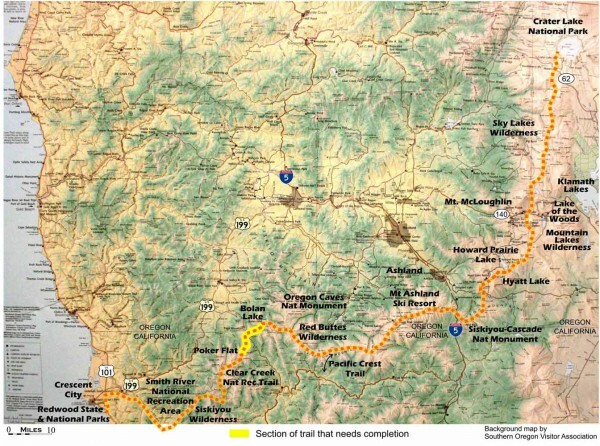 Download the Coast-Cascade Trail draft proposal (1.2mb) for construction of last eight miles of trail (note: the previous name for the trail was Coast-Cascade Trail now changed to Coast-Crest Trail because it links the West Coast Trail and Pacific Crest Trail). 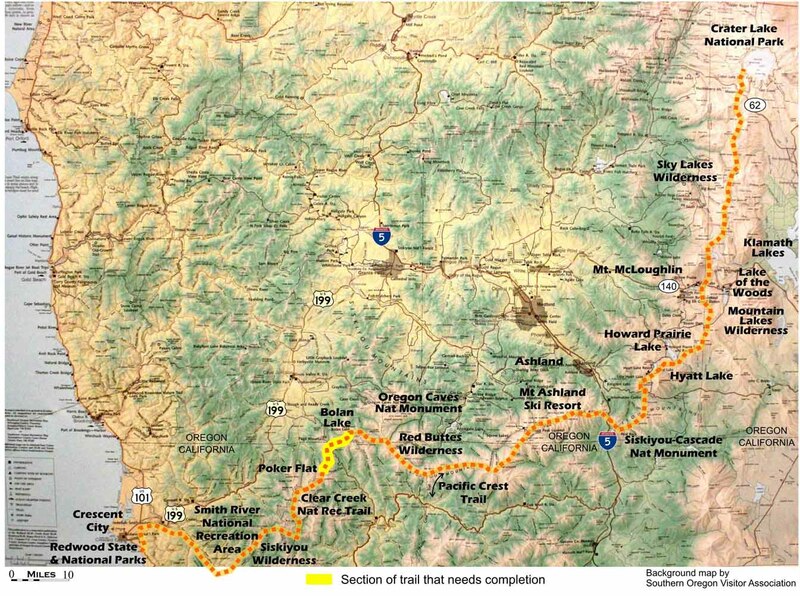 Map shows the trail route from Redwood National and State Parks on the California coast to Crater Lake National Park on the crest of the Oregon Cascade Mountains. Map showing the trail from Redwood National Park to Crater Lake National Park. 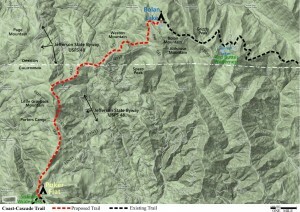 The yellow marker shows the eight mile section that needs to be constructed to complete the trail. Click image to see enlargement. Map shows the eight mile section that needs to be constructed. For more detail see the final eight miles. Coast-Crest Trail: The Siskiyou to Red Buttes Wilderness connector trail between Poker Flat and Bolan Lake is indicated with a red, dashed line and existing trails with a black, dashed line. Click image to see enlargement. The Coast to Crest Trail offers an opportunity to merge recreational resources managed by Federal and State agencies to create a new tourism marketing opportunity for the states of Oregon and California and a recreational classic for outdoor enthusiasts. Benefits include increasing inter-agency partnerships and cooperation to increase recreational use of public lands that have been traditionally under utilized. These improvements ultimately will contribute to regional economic diversity and stability in low economic communities.